Time has not healed the Democratic party’s wounds. On Election Day 2016, Democrats suffered a devastating and shocking loss. A year later, they’re still sorting through the wreckage. The infighting, the divisive personalities and the questions about how it happened are still front and center, threatening to hold the party back in elections on Tuesday and into next year’s midterms. 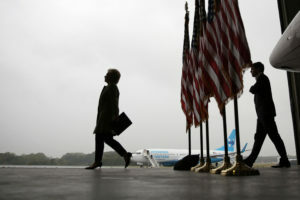 Hillary Clinton is on a tour promoting her book on last year’s campaign, entitled “What Happened.” The man she defeated in the party’s presidential primaries, Bernie Sanders, and former Vice President Joe Biden are the two top possible presidential contenders in 2020. And just in time for a crucial race for Virginia governor, the Democratic National Committee’s former chairwoman, Donna Brazile, last week reopened the wounds over whether the party tilted the primary in Clinton’s favor. “2016 may be the first year on record that is actually 23 months long,” said Jesse Ferguson, a former Clinton campaign aide. Ferguson, like many Democrats, is aware of the danger in dwelling on the past. He noted that, after Republicans failed to defeat Barack Obama in 2012, the GOP commissioned an “autopsy” that argued the party should moderate its stands on immigration to win growing minority communities. Really? Trump promptly won the next presidential election on a hardline immigration platform. “The biggest mistake we’d make is figuring out how we would have succeeded in 2016 rather than how we can succeed in 2018 and 2020,” Ferguson said. Trump isn’t making moving on easy. During the campaign, he gleefully stoked the Sanders-Clinton division, touting hacked DNC emails that purported to show how party leaders tilted the primary toward Clinton. He hasn’t let up much, now arguing that federal prosecutors should be investigating this collusion rather than his own campaign’s possible coordination with Russia, whom intelligence officials blame for the DNC hack. The president is pouring salt in what may be the party’s deepest wound. Sanders supporters pushed their own candidate to lead the DNC this winter, but Rep. Keith Ellison of Minnesota was narrowly defeated by former Labor Secretary Tom Perez and now is Perez’s deputy. Perez’s predecessor was Brazile, who is now is promoting her own book about last year’s election — and her take on the race is rattling Democrats. She claims she thought about trying to replace Clinton with Biden after the Democratic nominee fainted in September. And Brazile says a fundraising agreement between the Clinton campaign and the DNC gave the candidate too much control over party resources. “The biggest mistake we’d make is figuring out how we would have succeeded in 2016 rather than how we can succeed in 2018 and 2020,” a former Clinton aide said. Some Democrats were dismayed to see this division re-emerge just days before a critical race for Virginia governor where the party’s candidate is in a tight race. The party has several big choices to make. Some argue for a greater focus on white voters who didn’t graduate from college, a demographic that swung sharply to Trump, especially in the Rust Belt states that handed the president his Electoral College margin of victory. Others contend the party has to reach out to more affluent, college-educated whites who may lean conservative but are disgusted by Trump. Still others call for an intense focus on young, black and Latino voters to turbocharge the base of the party. There have been some promising signs on that front. Democrats have a shot at capturing the House majority next year, thanks to GOP retirements and solid recruitment of candidates in competitive seats. The Democrats need to flip 24 seats to win control of the House, and their top targets are the 23 districts where Clinton prevailed over Trump last year. The Senate poses a greater challenge, with 10 Democrats seeking re-election in states Trump won. The party is awash in new candidates and money is pouring in for its House races. According to an analysis by the publication Roll Call, 16 Democratic challengers outraised Republican incumbents in the most recent quarter. Meanwhile, the Republicans are engaged in their own brutal infighting. Two retiring senators have warned that Trump is a danger. Former presidential counselor Steve Bannon is seeking primary challengers to other GOP senators. The Republicans’ legislative agenda is at risk of complete collapse, and speculation swirls that prominent Republicans like Ohio Gov. John Kasich could take Trump on in 2020. The Democrats have dozens of elected officials thinking about the presidential race, but two party elders loom over the field — Sanders, 76, and Biden, 74. Still, Democrats argue that, unlike last election, no candidate has an obvious advantage with the party establishment. “No one is freezing the field this time around,” strategist Jim Manley said. Jeff Weaver, who was Sanders’ 2016 campaign manager, argues that the splits in the party are just the latest version of a battle that’s been raging ever since the 1990s between liberal activists and a more centrist establishment. “It keeps bubbling up, and until that’s addressed it’s going to keep bubbling up and continue to affect elections,” Weaver said. It’s been a year since Trump’s win. What have both parties learned?